Hospitalized after drowning during a rescue attempt, newly graduated U.S. Marshal Will Castleton is besieged by visions of a hulking executioner torturing a bound man. A perilous race against time leaves Will broken, unsure if he even wants to join the marshals. Escaping to his Michigan hometown, Will finds his father dying, a young woman's ghost desperate to communicate with him, and a biker kingpin out to make a statement by taking out local law enforcement's golden boy. Not Harry Dresden - Thank God! I think I'm just saturated with the current trends in so-called "paranormal adventures." I'm full to the brim with all the Buffy-esque cliches of secret societies, vampire cabals, werewolf packs, wizard colleges, super-clandestine anti-monster government alphabet agencies and the rest. Just the other day I was pining for something - if you'll forgive the expression - a little more down to earth. BAM! Along come Misters Bain and Castleton. The overall atmosphere of these stories actually reminds me a bit of the Silver John stories by Manly Wade Wellman. The "paranormal" is very personal, very local, which for me makes it much creepier than the more outrageous adventures of Harry, Buffy, and the other way-too-superhero heroes. I can enjoy a good Dresden story, but the settings, characters and plots are so extravagant that it's simply a fable, a myth to me. Will Castleton's adventures, however, hit a little closer to home. Indeed, the only monsters you will meet in these tales (for the most part) are the real ones that we *all* have to contend with - human beings gone bad. Add to that a nicely paced, flowing style and a great narrator, and - for my money - Mr. Bain's work stands up to the best of 'em. Frankly, I think he has found the voice that the much-overrated Mr. King has - IMHO - tried for but never really achieved. Keep them coming, David Bain! 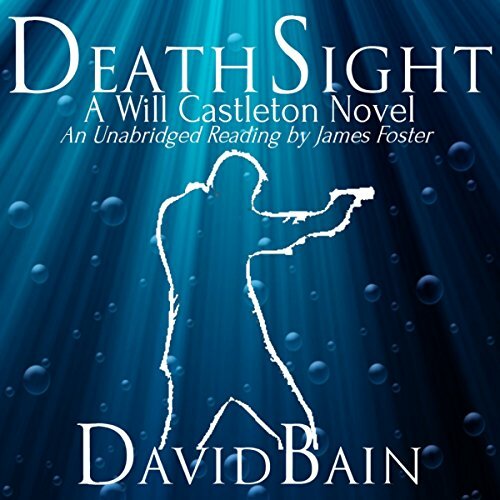 Would you consider the audio edition of Death Sight to be better than the print version? Well, that's all a matter of opinion. Some people like reading more than listening and vice versa. Having read and then listened to it though, I will say it was nice to be able to listen to the story while I was doing other things with my eyes and hands. He has a pleasant voice that fits the main character. I also liked his pacing. Sometimes in audiobooks, the narrator reads slower than I'd like. Unfortunately I couldn't listen to it all in one sitting because I lack the focus most of the time. However, I listened to the first half in small spurts and finished the second half in one sitting. So I'd say it's riveting enough to make me want to. Yes, I enjoyed the narration. The story was a different perspective on what it might be like to have a power like ESP and the impact it can have on your life. What was one of the most memorable moments of Death Sight? At one point in the book the main character is "connected" to another character in such a way that he feels and sees what the other guys in feeling and seeing and he is being tortured. The writer's description description of what was happening made you see it and feel it yourself. What does James Foster bring to the story that you wouldn’t experience if you just read the book? Definitely, Mr. Foster's voice is excellent for narrating. His renditions of expressions and voices really made the book. If it weren't being told to me I am not sure I would have finished the book. I just thought it was great that the author allow the male characters to have feelings. Thumbs up!! Would recommend to others.